If you have domain names registered elsewhere but use them on a Winhost site, you may want to consider moving your domains to your Winhost account so you have all of your web site properties under one (virtual) roof. Here’s how you do that. We can accept incoming transfers of .com, .net, .org, .biz, .cloud, .club, .info, .name, .pro, .store, .xyz domains. Make sure the domain name is unlocked at the current registrar. If whois privacy is enabled, you will have to disable it during the transfer process. If your domain name was registered or transferred less than 60 days ago, it is not eligible for transfer until 60 days have passed. The 60 day non-transferable period also applies if you changed the domain registrant’s contact organization or the registrant’s first or last name when an organization is not listed. We have some videos that cover the domain preparation process for the most popular registrars. You can see them here. To get started, log in to Control Panel and click the Domains tab. Click the Transfer Domain Name button. Enter the domain name you wish to transfer, select the extension and click the Continue button. Go back and check the pre-transfer steps and make sure you haven’t missed anything. If the transfer initiation still fails and you are unsure why your domain is not eligible for transfer, please contact the current registrar. WHOIS Privacy – choose whether your whois contact information will be visible to the public. There is a $5 annual fee to activate whois privacy. Whois privacy is not transferable from your previous registrar. The next step is to double check the contact information, name servers and “Transfer Request Approver” email. You must have access to the Transfer Request Approver email address in order to complete the transfer process. You can edit any information that needs to be changed on this page. If everything looks good, click the “Transfer Domain Name” button. 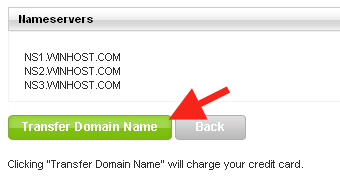 If you need to set up a new site for the domain name, you can click the Order New Site for this Domain button on the final page. Once you have approved the transfer to us, the actual transfer between the two registrars can take a day or two. Depending on who the old registrar is, you may be able to speed up the process by also approving the transfer from their control panel. Though this is not always applicable, many of the larger registrars, such as GoDaddy, do allow for transfer approval. If you run into any problems, we have a Knowledge Base article that provides a step by step explanation of the domain transfer process. Is this site for transferring an already declared domain name or does the site offer a “check” for a new domain to see if it is being used? These instructions are for domains that you have already registered. If you need a new domain, you can order it here. That will also check to see if the name is available.